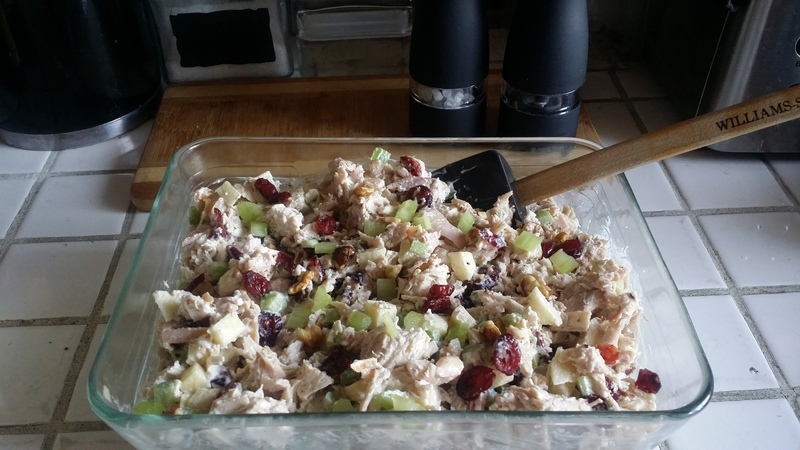 Chicken apple cranberry walnut salad.. In a medium bowl, mix together the mayo, yogurt, mustard. Gently fold in the cranberries, walnut, apple, and chicken. Season with salt and pepper. Cut croissants in half. Place spinach on bottom half, followed by the chicken mixture. Top with other croissant half and enjoy! Combine all ingredients except for avocados in a large bowl and mix well. Cover and chill for a few hours or overnight. Right before serving, add avocados and mix gently, being careful not to mash avocados. Serve cool or at room temperature. (I prefer it a bit cooler) Enjoy with Wonton chips (my favorite, just fry the small wonton wraps) or tortilla chips. Heat a wok or large saute pan over high heat. Add some cooking oil. Add the garlic, cabbage, carrots, ginger, and mushrooms and stir-fry for 1 minute or until vegetables are softened. Add the rice wine, soy sauce, sugar, sesame oil, salt/pepper. Continue to stir-fry for another minute. Remove the filling and place on a baking sheet tray in a thin layer to cool. Raise one end of the tray to allow for the liquids to drain away from the filling. Fill 1 Tbsp of filling for each egg roll. Roll the egg roll, making sure you are rolling tightly. 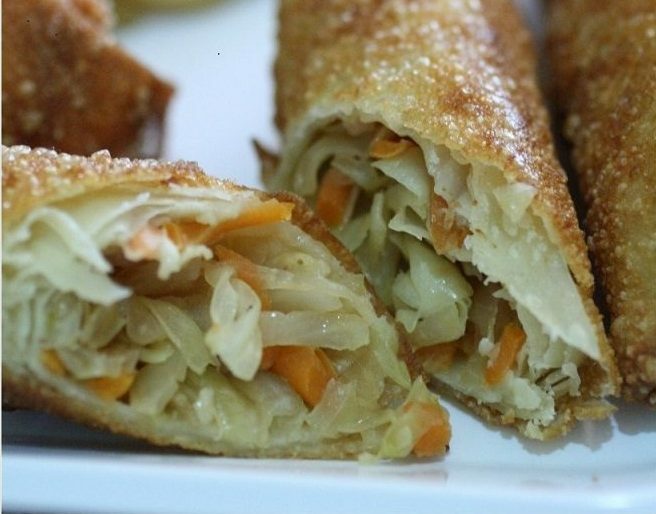 Use the cornstarch and cool water mixture to seal each egg roll. Heat up about 2 inches of oil in a sauce pan. When the oil is hot, place the egg rolls in the hot oil carefully and fry in batches. Fry until golden brown, a minute or two max. Strawberry Pretzel Salad – a crushed pretzel crust, sweetened cream cheese filling and a strawberry Jello topping with fresh strawberries. 1. Preheat oven to 400 degrees F. In a medium bowl, stir together the pretzel crumbs and sugar. Pour the melted butter over top and stir with a fork until all of the crumbs are evenly coated. Press into the bottom of a 9×13-inch baking pan. Bake for 10 min, then cool completely. 2. Using an electric mixer, beat the cream cheese and sugar on medium speed until light and fluffy, about 3 minutes. Using a rubber spatula, gently fold in the Cool Whip. Spread evenly over the crust and refrigerate while you prepare the topping. 3. Place the dry Jello in a large bowl and add the boiling water. Stir for at least 2 minutes, until the gelatin is completely dissolved. Stir in the cold water. Refrigerate for 1½ hours or until slightly thickened. Stir in the strawberries and pour over the cream cheese layer. Refrigerate for at least 3 hours, or until the Jello layer is set. Cut into squares to serve. Leftovers should be stored, covered, in the refrigerator for up to 3 days. In my house the leftover only last about 1/2 a day.